Three train, hour and one-half hour count wheel strike, cast iron, plate and spacer upper frame mounted on curved legged lower frame, pinwheel escapement with Harrison type spring remontoire (constant force mechanism) with 20 second period, reverse torque maintaining power. 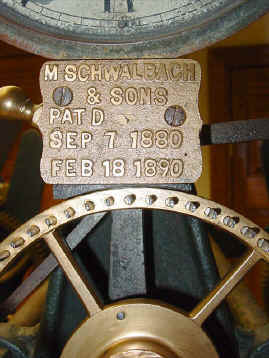 70"h x 47"w x40"d.
Schwalbach was the founder of the Star Tower Clock Company. His firm is known to have installed between 55 to 70 tower clocks during it's 42 year existence. Clearly this was a limited production clock. 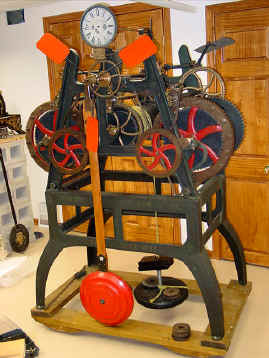 Schwalbach is more known for his contributions in the development of the typewriter under the brand name of Remington, but he was awarded three US patents in connection with his work on tower clocks - all involved with his version of the remontoire (constant force) mechanism and 'free' pendulums. As it turns out, a patent in connection with the 'free' pendulum design should probably not have been issued as this was a copy of that already in use by the Joseph Mannhardt company in Germany since at least 1862 1. Schwalbach was a German immigrant. His use of a 'crutchless' pendulum, where the escapement pallets are directly connected to the pendulum rod instead of a crutch was widely used on the European continent. 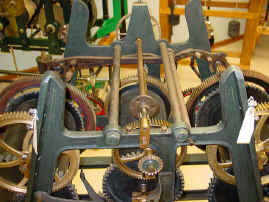 This was almost exclusively used in connection with the pinwheel escapement and this version of crutchless escapement was invented by Auguste-Lucien Verite b. 1832 - 1887. 2. The remontoire's purpose is to deliver a constant force to the escapement and to mechanically isolate it from the rest of the going train. This diminishes errors due to manufacturing variances in the wheel train and frictional variations. 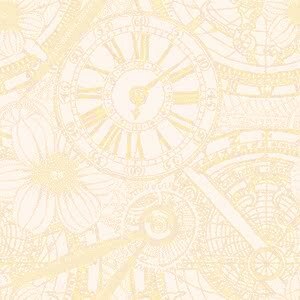 But the most important function, encountered in the environment that tower clocks operate in, is in isolating the escapement from disturbances weather plays on the huge clock hands through wind and snow build up. These forces will be transmitted backward through the wheel train, and can effect the precision of the clock. To overcome this, most tower clocks were built with a robust margin to deliver power to the motion works and thus the clock hands and overcome most variances through brute force. The first as demonstrated in this tower clock is the escapement remontoire. 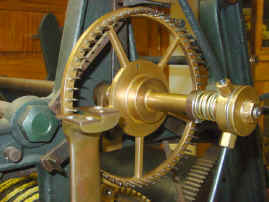 Here the motive power, usually a coiled spring, is applied directly to the escape wheel. In this case the pinwheel. 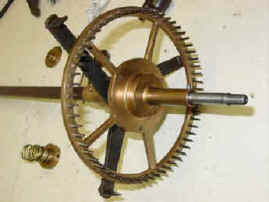 In Harrison's case it was the toothed 'grasshopper' escape wheel. The spring is kept wound in a narrow range to keep a constant force through repeated application of a cam turning to release periodically a detent that in turn allows the spring to be wound by application of power from the main going train. 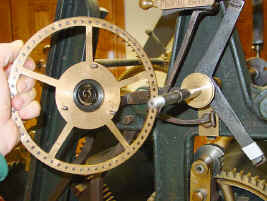 The main clock hands are also advanced forward during this time. See the Dent Concorde clock that also demonstrates a spring escape remontoire with Harrison's escapement. The second is a train remontoire. Here the motive power is supplied further down the going train, usually one wheel down from the escape wheel. See the Wagner tower clock for an expanded explanation of this type of constant force mechanism. This clock was featured in a NAWCC Bulletin article by Joseph G. Baier, August 1973, Vol. XV, No. 11. It was originally installed in the St. Mary of Rosary Church, Buffalo, NY., later renamed The Polish National Cathedral after the church had a falling out with the Pope. It originally struck a bell of 7,500 lbs. The church has since had it's clock tower removed and has been converted to a mosque. 1. Turmuhrwerke, Bernard Schmidt, pg. 54, Joseph Mannhardt, Munich, Germany, 1862, illustration. Compare this to Schwalbach's patent dated September 7, 1880, No. 232,073. His earlier patent dated November 10, 1874 while less a direct copy as was his later patent, still draws heavily from Mannhardt's design. There is also a reprint from a book published in 1894, Die Turmuhren, Curt Diezfchold, that has a diagrammatic illustration of Mannhart's escapement that closely parallels Schwalbachs. 2. Echappements d'Horloges et de Montres, Charles Gross, pp. 62.